delivering up to 1750Mbps of Wi-Fi speed over dual 5GHz (1300Mbps) and 2.4GHz (450Mbps) bands. - Fully expanded Wi-Fi coverage with three external detachable antennas and three internal antennas. - Give every device the bandwidth it needs, setting limits and controlling traffic with IP-Based QoS. - Set limits on when and how devices can connect to internet and keep children safe with parental controls. - Guest Network provides visitors with Wi-Fi access separate from your main network. - Easily set-up your Wi-Fi devices with a secure connection using the WPS button. - Advanced security encryption protects your data. TP-LINK Tether App Adjust settings from mobile devices with the TP-LINK Tether App (Android, iOS). Using four Gigabit Ethernet and two USB Ports. 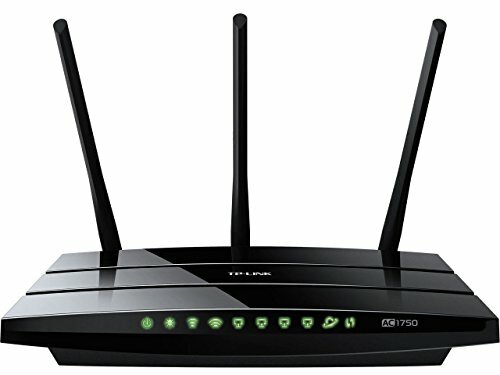 Supports 802.11ac and is backwards compatible with 802.11 a/b/g/n. This Certified Refurbished product is tested & certified by TP-LINK to look and work like-new. The product includes all original accessories, and is backed by a 90-day warranty.